Students at Daniel J. Corkery Elementary School have always been able to play soccer, but they had to contend with errant gravel causing slippage and a dangerous metal band that was a major tripping hazard. 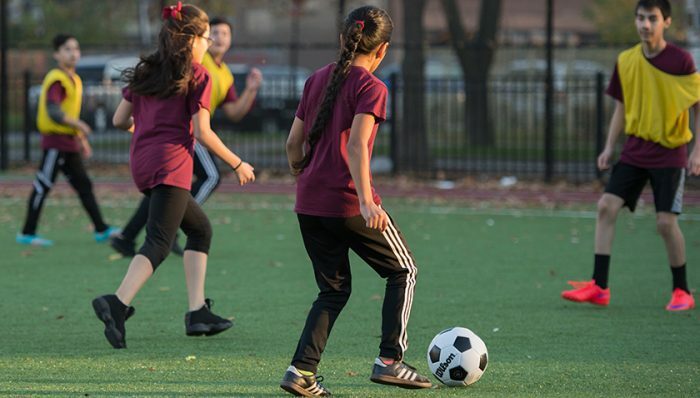 But now, at their Space to Grow schoolyard, students at Corkery have a beautiful new soccer field—with no hazards. “The soccer field was desperately needed in the community,” says Carol Devens-Falk, principal at Corkery. The new schoolyard includes a multipurpose turf field, jogging track, half-court basketball court, play equipment for younger and older students, outdoor classroom area, native gardens and trees, vegetable gardens donated from The Kitchen Community and seating. Corkery’s Space to Grow Schoolyard Open for Business!